It is believed that there are over 2 million deaf or hearing impaired people who wear a hearing aid (and a further 3 million people who would benefit from wearing one). This is a significant group in number and spending power potential. Raising your level of customer service to include this group by installing an induction hearing loop makes good business, moral and legal sense. You may be open to legal action if your level of customer service is lower or worse for the disabled (hearing impaired) than that for all other customers. A hearing loop system helps deaf people who use a hearing aid or loop listener to hear sounds more clearly by reducing or cutting out background noise. At home, for example, you could use a loop to pick up sound from your television, hi-fi or radio. A loop can also be set up with a microphone to help hearing aid users hear conversations in noisy places. In the theatre, a loop can help you hear the show more clearly. A loop cannot be used to give stereo sound. How induction loop systems work. An induction loop is a cable that encircles the listening area. It is fed by current from a loop amplifier. Kirkpatrick Sound Engineering uses only the best quality loop amplifiers and works closely with manufacturers to improve design and functionality. Two of the quality brands that we use are 'Ampetronic' and 'Current Thinking' but are always scanning the market for new companies with quality sound products. The amplifier gets its signal from a microphone placed in front of the person speaking or by means of a direct connection from another sound source, such as a sound system. The resulting electric current in the loop produces a magnetic field, which corresponds to the sound. You can then pick up this magnetic field if you are sitting within the area of the loop and your hearing aid - or loop listening aid - is switched to 'T'. You will need to adjust your own hearing aid for volume. If you have a hearing aid with a 'T' setting all you have to do is switch to 'T'. If you do not have a suitable hearing aid you can still use a loop, but you will also need a loop listener. Some loop listeners are small boxes with headphones - others are worn as an earpiece. More than one person can benefit from a loop installed in a room as long as they each have a hearing aid set to 'T', or a loop listener. You are not wired to any other equipment and you are therefore free to listen from anywhere within the loop and to move around. Some hearing aid users find that they have to turn up the volume on their hearing aid a little when they switch to 'T' but this should not be a problem if the loop has been set up properly. However, even if the loop system works correctly, you might pick up buzzing noises when you set your hearing aid to 'T', or when using a loop listener. This is caused by interference from electrical equipment such as fluorescent lights, dimmer switches or electric cables. Although loop systems are generally designed for use within the area of the loop, the loop signal can spill out into other rooms. Walls, ceilings and floors do not block the magnetic waves from a loop. 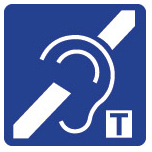 Hearing aid users whose hearing aids are also switched to 'T' and people using a loop listener outside the room may be able to overhear sound or conversations. Rooms that are next to each other, and rooms directly above and below the loop, can be affected. This could be a problem, for example, if a next-door neighbour also uses a loop system, or if you need to have a confidential conversation. You could try to reduce the size of the loop in order to get round this problem - you might need to re-arrange the seating. An alternative solution is to invest in a 'Phased Array' loop system where the loop array is designed to contain the loop effect to within the desired area.